For years now, we've trekked to North Carolina's Outer Banks for an annual week's worth of sun, surf, and relaxation. The one truism common to all the vacation houses we've rented -- at least in our price range -- is that the "Stereo-CD player" feature in the specs invariably overstates the junk that an owner would dare leave out for a renter's use. We quickly learned that if we wanted music, we needed to bring our own gear. So, for years, along with the boogie boards, beach chairs, and kites, we've also packed RadioShack's compact Optimus STA-300 receiver, Celestion 3 speakers, and whatever portable CD player we had on hand. Recently, the STA-300's right channel gave up the ghost. The Optimus had cost only about $100, and having its bad capacitor replaced would have cost more than that, so lately we've made do with a Sirius boom box -- it got whatever baseball we wanted, but we were slaves to the sound quality of whatever station we tuned to. If we craved, say, the Jayhawks' Hollywood Town Hall, we were out of luck. And, well, it's a boom box -- hi-fi it ain't. We lusted after a small amplifier or receiver that could do the vacation-audio lifting. Meanwhile, I guess it was always only a matter of when, not if, the crafty folks at Audioengine would gussy up the nifty little amplifier built into their A2 and A5 powered speakers and put it in its own box. 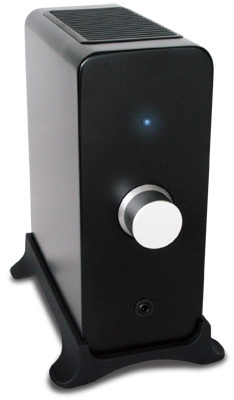 Enter the Audioengine N22 integrated amplifier ($199 USD). Like every Audioengine product, the N22 comes with all you need to bring your music to life. First, everything is lovingly packed inside a cinched sack of soft cloth: the N22 with attached stand, an outboard power supply identical to that used with Audioengine's A2 and A5 powered PC speakers, a 3.5mm patch cord with which to connect an iPod or other MP3 player, an RCA stereo patch cord, and two 6' lengths of 16AWG speaker wire with tinned leads. Just add speakers and a sound source, and stir. Nothing could be easier. The N22 measures 11.5"H x 7.5"W x 9.5"D and weighs all of 3.5 pounds. With an outer shell constructed, improbably, of wood-sheathed MDF, the front panel has only an Off/On/Volume pot, a mini headphone jack, and a nifty blue power-indicator light. 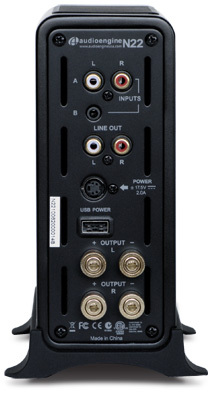 The rear panel sports, from top to bottom, RCA stereo inputs, a 3.5mm input, RCA stereo variable preamp outputs (nice if you want to connect a powered subwoofer), a USB power outlet, and two pairs of gold-plated, five-way speaker binding posts. Yes, you read that correctly: binding posts. Their presence indicates the N22's build quality and the care with which Audioengine designs its components. I daresay most manufacturers of a smallish $200 component would opt to save a few bucks and use spring clips. One of the concessions to the N22's price that Audioengine did make is the omission of a source-selection switch. 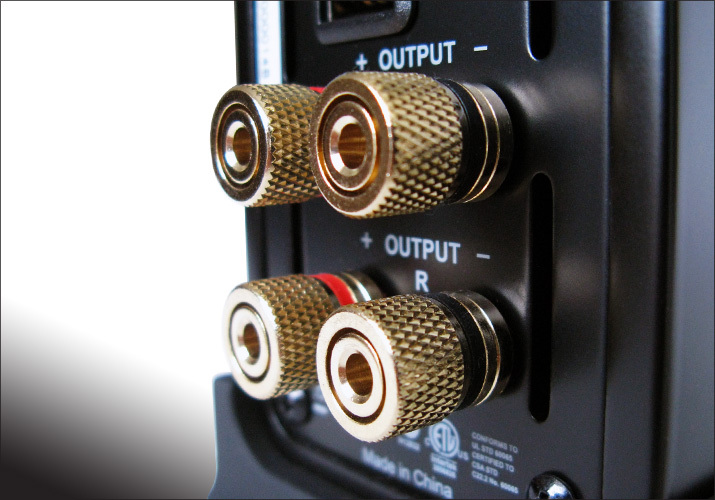 Both the RCA and 3.5mm inputs are live, so you could, I suppose -- if you really wanted to -- play two inputs simultaneously. I didn't try this. The USB outlet is a power outlet only, useful for charging your iPod or connecting a wireless receiver; it's not an audio or data port. Setting up the N22 was ridiculously easy. First, I connected Audioengine's P4 speakers with the supplied wire, albeit terminated with banana plugs. Then I plugged my iPod directly into the N22's 3.5mm input, connected the power supply, put on, yes, the Jayhawks' Hollywood Town Hall (CD, Def American 26829-2), and turned the volume pot all the way up. The sound was faint. Barely audible. Oops. What's the first rule of outputting an iPod signal to an outboard device? Turn your amplifier's volume all the way down, turn your iPod's volume control all the way up, then slowly increase your amp's volume until it's where you want it. After I'd done that, everything was fine. Next, I connected the iPod via Aperion's HAL wireless audio appliance. I plugged the HAL's receive unit into the N22's USB power receptacle, the send unit into a USB port on the Hewlett-Packard Pavilion laptop computer I keep in my music room, the receive unit's output to the N22's RCA inputs, and the iPod to the HAL's send unit. Elliott Smith's masterful XO (CD, DreamWorks DRMD-50048) played unfettered -- just as if the connection were hardwired. Then came a Panasonic SL-SV570 portable CD player, connected to the N22's RCA inputs from the player's line-out/headphone jack. Folks, what I had here was a bona-fide audio thrift rig: the sound of Crowded House's glorious Intriguer (CD, Fantasy FAN-32257) was far better than it had any right to be -- a tribute to the P4s as much as to the N22. And thank you, thank you, thank you, Neil Finn and Nick Seymour, for rebuilding the House -- as vital a band as any of the past two decades. Maybe it's the reviewer's sense of duty, or just maybe it was a skosh of sand-between-the-toes nostalgia, but in went the Celestion 3 speakers. They were softer than the P4s, but with a deeper soundstage, more pinpoint imaging, and slightly deeper bass. The Celestion 3 is ideal for "portable" applications, owing to its larger midrange driver, inky-dinky power requirements (10W), and respectable sensitivity (88dB). The Optimus STA-300 put out only 15Wpc RMS, so the Celestions were a near-perfect fit: great sound with minimal fuss. The N22 outputs 22Wpc RMS, which is spot-on for the Celestions as well as the P4s. Both a swinging nugget like the Subdudes' sublime Annunciation (CD, High Street 72902 10323-2) and a contemplative newbie like José González's In Our Nature (CD, Imperial 9367-2) could have sounded better only through my audiophile rig, which stood idling patiently in the background -- no doubt grinning paternally at the performance of smaller, more inexpensive siblings. The N22's preamp outs ain't there fer nuttin'. Our Mirage LF-100 powered subwoofer is taking a vacation of its own in the music room while subs from Velodyne and MartinLogan cycle through. It took me no time to connect the Mirage to the N22, courtesy the Audioengine's preamp outputs. Like most powered subs, the Mirage has only one input, theoretically to be fed by an A/V receiver's dedicated subwoofer output. Hmm . . . the N22 has stereo preamp outputs, which the manual says can drive a subwoofer. But which to use -- right or left? 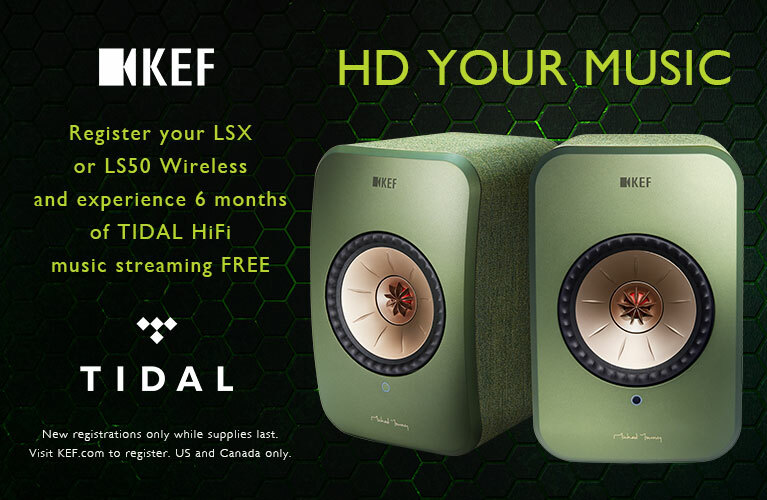 A quick e-mail to Audioengine produced the answer: Take your pick -- either will do. But let's think about this. A preamp-output signal is a stereo signal broken into right and left channels. If I pick only one output, then I'm retrieving the signal from only one channel. What Audioengine's either/or solution assumes is that most or all deep-bass signals are mono and distributed evenly to each channel. The accuracy of this theory was borne out in the listening. I connected the Mirage sub to the N22's left-channel preamp out and played the Black Keys' sublime, quirky, and brilliant Brothers (CD, Nonesuch 520266-2). I then played it with the LF-100 connected to the right channel. I didn't hear any appreciable difference in the sound. Ladies and gentlemen, the solution has landed: The Audioengine N22 is the perfect remedy for the Vacation Tunes Blues. It's small and unobtrusive enough to haul around, its connections are almost too easy to manage, and it delivers terrific sound. Now, 22Wpc won't blow the side off your house -- not even close -- but it will be more than enough for most modest listening applications. The 3.5mm input will, of course, accommodate the output from a PC (or a Mac, for the more fortunate), meaning that you could use the N22 as the power source for your PC's speakers and for an independent audio input: an iPod, an MP3 player, or a portable CD player. In short, the N22 offers all the benefits of flexible inputs, modest size, and crystal-clear sound. My daughter, who's off to university in about a year and a half, has already laid claim to the N22: "Daddy, that's perfect for a dorm room." Well, yep, it sure is -- and for any other nearfield application you'd care to mention. I'll probably give her the Audioengine P4s as a bonus -- not because Audioengine recommends them as partners for the N22 (big duh there), but because no way is she getting her mitts on my Celestion 3s. She's also lobbying hard for a MacBook, another notion I find hard to argue with. I have every confidence that the N22 will serve the Apple's sound requirements as well as my daughter's musical needs. The Audioengine N22 is a terrific little component and an incredible value. It's small, inexpensive, and ridiculously easy to use. As I finish writing this review, it's playing Ray LaMontagne and the Pariah Dogs' lovely God Willin' & the Creek Don't Rise (CD, RCA 65086-2). Ordinarily, I'd have Ray coming through the Big Rig (Sunfire amp, AVA Omega III preamp, Parasound CD player, Legacy Classic speakers), but, truth be told, the N22 with the Celestion 3s and Mirage LF-100 sub sounds fabulous. Highly recommended.